Let's start at the end. I got some amazing nail mail today that I am so excited about! It was a biiiiiig ol' package from Ninja Polish. I even took pictures of it all. Stupidly, I forgot to skip my Julep box this month so I got some new polishes from them. I really should cancel my subscription because I never want the polish but I keep thinking maybe the next month they will do something interesting... At least these are suedes. Not a bad month to get I suppose. If you know me, you know I can't resist Color Club, and I found their magnetics at a local drugstore on clearance for $2.49 each! So of course I bought the 5 I didn't already have... Even though they're pretty gross colors. But I have a CC addiction. I know it. The lovely Nicole from Elixir Lacquers sent me some polishes for review! I'll be swatching these soon. Also got some review polishes from I Love Nail Polish! Can't wait to try them. I picked up some polishes from the OPI Skyfall collection. And while I was getting those OPIs, I found a bunch of super cheap clearance ones which of course I couldn't resist, especially because they also came with cute little OPI cosmetic bags. There's no excuse for this. There's just none. I'm gonna go now. Bye. seven random swatches for your viewing pleasure! Hey guys! Tonight I'm gonna just post some totally random swatches I have had laying around in my folders for a while. They don't deserve their own posts, but they deserve to be seen! I still aim to one day have posted swatches or manicures of my entire collection... It will probably never happen but a girl can try! Let's start with a cute OPI. This is an older color but I think it is in the core line. Maybe. Can't remember. I picked this up in a clearance sale for two dolla! It takes three coats to cover fully but the color is really cute. This is one of the colors from a recent collection, Electronica. I didn't pick it up originally but when I found it on clearance at Sally's, plus an extra 50% off, it came home with me. I'm glad it did, because the formula is great and I don't think I have another royal blue like it really! 2 coats. Picked up this one in a blog sale recently. 2 coats for full coverage. Fun green. I love green nails. This is a new-to-me brand that I found recently at Winners. They were just $3.99 a pop so of them followed me home. This one is that color between pink and purple that I can't seem to resist! Formula was good, no complaints. Shown over Love At First Lavender, this is a glitter topcoat with fuchsia and blue glitter as well as some short holo bars that are kinda hard to see in the pictures, but they are there! It looked more fun in the bottle than it did on the nail. Not really satisfied. But it's okay. This is a color from SC that got really popular, but I can't really understand why because it is soooo sheer and annoying to apply. I put on 4 thick coats and it was still sheer, not to mention too thick to dry. I gave this away. Not a fan. This is an old swatch, sorry for the crappy pictures. Cute pink polish with pink glitter and holo glitter. I think this is three coats. There you go! That gets some clutter out of my swatch folders. But there is still a lot of unposted crap in there... Ah! Do you love my holiday blog layout?! I sure do!! Pirate Polish Christmas Collection - swatches and review! Hey everyone! I have a festive post for you today, featuring five beautiful polishes from one of my favorite indie sellers, Pirate Polish! 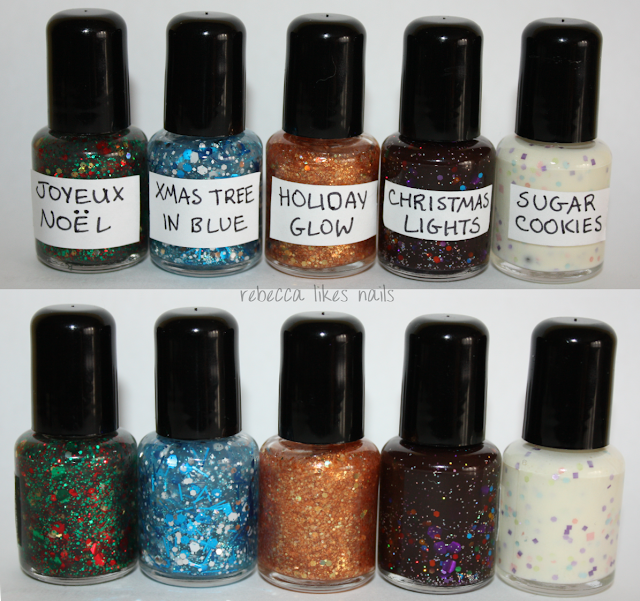 This is the Christmas Collection from Pirate Polish! I love holiday polishes, they are so fun. I'll start out by showing you my favorite of the set! Don't you just want to eat this up?! It's so cute and such a good interpretation of sugar cookies for your nails. Here I layered 2 coats of Sugar Cookies over one coat of white polish, just to ensure perfect opacity. The glitter was not hard to fish out and I just love the squares and the colors and man, it's perfect! My second favorite! A great layering glitter in a clear base. There's all sorts of blue, silver and white glitter. Here I've shown two coats layered over Zoya Kristen. Again, no issues with getting enough glitter onto the brush, great formula. I really like the bar glitters in this one because they're big enough that they don't look hairy and I didn't have issues with them poking out and annoying me. How Christmasy is this?! Red and green and gold glitter in different sizes, in a clear base. The layering possibilities for this one are endless, but I chose to layer it over a green creme, Essie Pretty Edgy. I've worn this once already, and I got a ton of compliments on it! People kept noticing how festive my nails were. This is a crazy flakey glittery sparkly golden polish. I chose to layer it over a dark blue (Orly Shockwave) but it can also be worn alone with 2-3 coats. This is packed with the ultrafine flakes and its totally gorgeous! Big win. Last but certainly not least, a dark purple jelly filled with bright hexes and tiny silver holographic glitter. Definitely looks like twinkling Christmas lights! I layered two coats over OPI Eiffel For This Color which was the perfect base match! With this one I did have to fish for some glitter a little but it wasn't a major pain. You can get these polishes in the Pirate Polish Etsy Shop. The full-size polishes are $10 each, or $45 for the set. Mini size are $5 each, or $22 for the set. You can get 15% off any order from Pirate Polish this week with the code "REBECCALIKESNAILS"! How awesome is that?! Let's all thank Tara for the great discount! Be sure to also check out Pirate Polish on Facebook! My nails are ready for the holidays! Which one is your fave? Hey guys! Today's post is for my friend Drew who informed me she has been waiting too long to see me post about this polish. Here you go Drew! I hope this satisfies you. This polish is truly ridiculous. Real gold on yo' nails. Big pimpin'. Even the bottle is awesome. I've actually got three manis with this top coat to show you today! The first time I wore it, I chose a different color on each hand because I couldn't decide what I wanted to layer it over. Neither ended up being my favorite. The gold flakes look great over deep vampy polishes! But I wasn't feeling this shade, I wanted something more purple. And on the other hand? Looks great over blue too! Pretty sure it would look good over anything. Those combos didn't satisfy me. So today I did another manicure with the golden gun. And I love it! So here's a bunch of pictures. Tada! This is just the look I wanted. Pastel prettiness with added gold sparkle. This manicure started with Zoya - Kristen, a lovely pastel gray-blue that covers in 2 coats. I then did a gradient using Lime Crime - Lavendairy, a bright pastel purple. Finish with two coats of The Man With The Golden Gun! I will admit, it is pretty crazy to wear actual gold flakes on your nails only to remove them in a few days (or a few hours, depending on your mood.). But I love it. I'ma put some gold on my if I wanna. This polish retails for around $30 depending on where you get it. Very pricey, but hey, it's a collectible! Justified. i just love glitter, okay?! Pretty & Polished - Party At Joes!